Fab Fours' premium powder coating provides a protective barrier between the heavy duty steel of the bumper and the elements. The gloss black finish will protect the bumper and provide aggressive styling. American made strength is what you're looking for and that's exactly what you're going to get when you put on a Fab Fours Black Steel front bumper. The Black Steel front bumpers are engineered to fit high and tight on your truck and are heavy duty to keep your rig protected. The Black Steel series front bumpers add an aggressive look to your truck and add the protection your truck needs to keep your front end looking good. The Black Steel front bumper is finished in gloss black powder-coat to give it a sleek and mean look that is going to draw some major attention. Black Steel front bumpers are designed to house your vehicle's factory fog lights. This bumper is equipped with cut outs on the bottom of the bumper for access to your factory tow hooks. There are three options for this bumper. The Fab Fours Black Steel Grille Guard Front Bumper is the Fab Fours Black Steel base bumper equipped with a full guard. 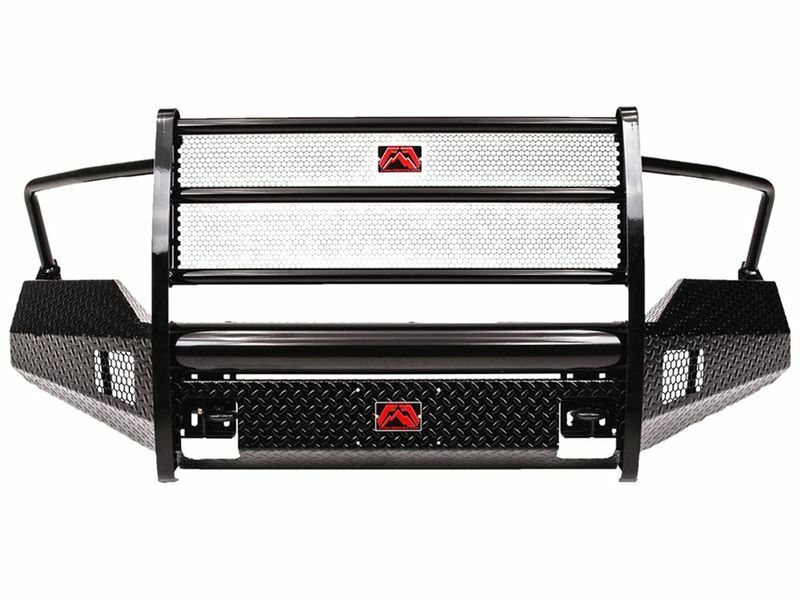 The Fab Fours Black Steel front bumper is ready to bolt on to your truck the day you get it. Upgrade your ride with a quality bumper developed by Fab Fours.